Maybe you're not wild about our elected officials in Washington, but here's a reason to send a little love their way. A provision buried deep into the 1300-page five-year highway appropriations bill approved last year instructs Amtrak to allow cats and dogs on many of its trains. Amtrak started giving animal companions a ticket to ride on some routes in the northeast and Midwest last October. The pilot program ended earlier this month, and Amtrak is now on the fast track to expand its Pets on Trains policy. Cats and dogs under 20 pounds are now allowed on the Springfield Shuttles, Northeast, Downeaster, Virginia, and Illinois regional routes and all cross country routes except the Auto Train. Animals can also travel on the Acela Express, but only on Saturdays and Sundays. To travel with your cat, all you have to do is get on board with Amtrak's rules. Among them: The cat must be in an approved carrier that will fit under your seat, and your trip must be no more than seven hours long. Oh, and just one cat is allowed per passenger. It was Rep. Jeff Denham (R-Calif.), who asked Amtrak to get the Pets on Trains policy rolling after he discovered his French Bulldog couldn't travel with him when he took the train. His Pets on Trains Act is part of the larger Passenger Rail Reform and Investment Act. The act allows Amtrak to have at least one pet friendly car on each train. 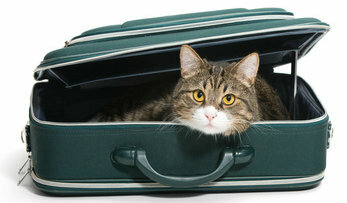 To travel with your cat, you need to make your reservations with at an Amtrak ticket agent or call 1-800-USA-RAIL. But your cat won't be getting a free ride. Tickets for animals cost $25. 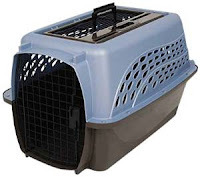 carrier for traveling with your cat . We all love to read about cats. Check here for the latest news about cat food, must-have cat toys, cat healthcare and more. I hope you enjoy the posts. 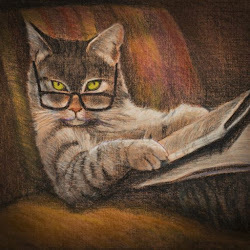 And when you're all caught up on the news, I hope you'll visit How To Live With Cats, my cat care website, and Thomasina's blog, Purrls of Wisdom About Cats. In case you're wondering, Thomasina's a cat! I have just the right ones for your vet clinic, cat grooming or cat sitting blog or Facebook page. Contact me at missyzane@comcast.net. We have an affiliate relationship with Google, Amazon and others. When visitors click on an ad and make a purchase, we earn a small commission that helps keep this blog running and the cats fed. Does Fish Cause Hyperthyroidism In Cats? Missy Zane. Picture Window theme. Powered by Blogger.